The 10 hours slow-cooked pulled pork burger on brioche. The Copper Pan in St Ives calls itself the sister café to The Pottery Green Bakers of Lane Cove, Gordon and Turramurra. We have previously reviewed The Pottery Green Bakers of Gordon. The Copper Pan has a good all day breakfast with delights such as poached eggs, feta and tomato on gluten free toast but today we were there for lunch. Just inside the St Ives shopping centre on the upper level it offers breakfasts, lunches and everything in between. Parking is easy and the restaurant is the first shop you come across as you walk in to the shopping centre. It’s always busy, but there is usually a table or two spare. The service is quick and efficient and our lunches came out quickly. Today we sampled the Vietnamese Paper Rice rolls with chicken and also the Pulled Pork Burger on Brioche. 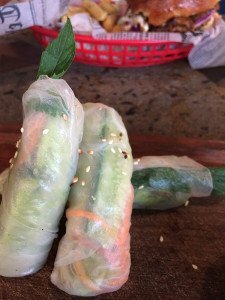 Vietnamese Rice Paper Rolls with Chicken. The Vietnamese Paper Rice rolls were fresh and light and cold enough to have come straight from a fridge. Served with soy and sesame dipping-sauce, the mixture of noodles, greens and a hint on mint make a really refreshing lunch and only $11 for three rolls. These rolls can also be served with beef. 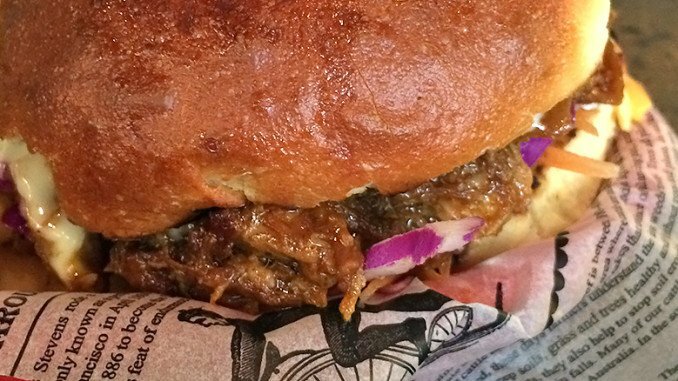 The pulled-pork burger is the other end of the scale. It is heavy and substantial and that’s a good thing. Served in a basket with chips, the pork has been slow-cooked for ten hours before pulling and then served with coleslaw inside a toasted brioche. This is a solid meal for lunch and will leave you full for the whole afternoon. This is a good spot for breakfast, lunches, morning and afternoon coffees. There is a sweets and cakes cabinet bursting with treats and freshly baked pastries. The décor is rustic big wood tables and metal fittings, which is a real treat in the midst of the slightly sterile atmosphere that is a shopping centre these days. There’s plenty of space in and around the café, so it is stroller, wheel chair and shopping-trolley friendly! Coffee is good, but not quite the same brew as you will find in The Pottery Green Bakers.